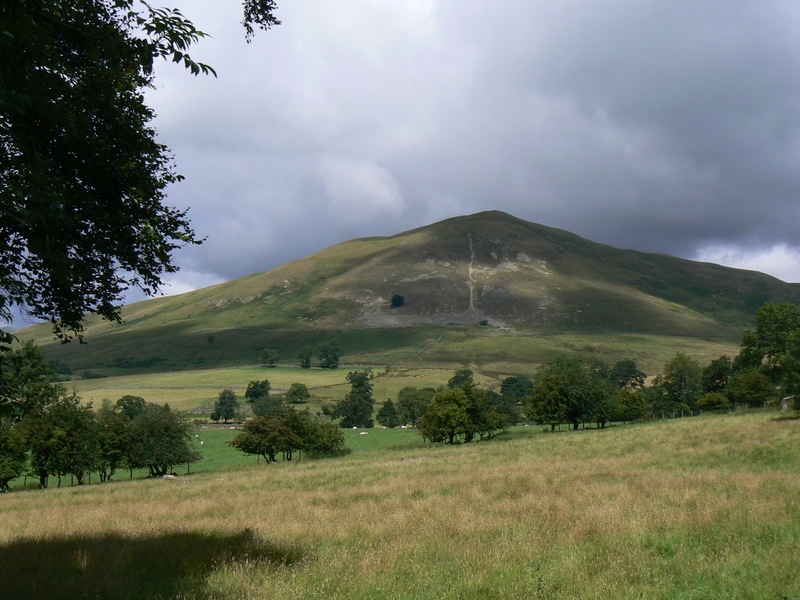 A fantastic walk combining a visit to Dufton Pike, the shapeliest fell in the North Pennines, with an exploration of neighbouring Brownber Hill. When I had climbed Backstone Edge and Knock Fell almost three years ago this part of the North Pennines made a great impression on me and ever since I have had Dufton Pike and Brownber Hill in mind for a walk. It had been three weeks since my last walk and in the intervening period I had moved house so I was ready for a walk regardless of the weather. As it happened the weather was a bit of a mixed bag, while it was cloudy on the whole the cloud only briefly touched the two summits I visited and at times even cleared the higher fells to the east. It was also quite a showery day but the showers were small and isolated. The climb on to Dufton Pike, the most shapely hill in the North Pennines, was steep but fairly short. The summit was unordorned except for the droppings of the local fauna. Due to its independence from the neighbouring fells Dufton Pike is a fantastic viewpoint. To the west the wide Eden Valley is backed by the Lakeland Fells (High Street could be clearly identified) while there is also a tremendous view down into Great Rundale to the east. There had been a few pockets of showers crossing the Eden Valley while I was on Dufton Pike and so far I had been lucky to avoid any. Not so on the next section of the walk as I was caught in quick succession by three separate showers as I descended Dufton Pike to briefly join the Pennine Way before breaking off to head for Brownber Hill. During the final shower I took shelter behind the wall separating Brownber Hill from Scald Fell to eat my lunch before contouring round on to Threlkeld Side to take some pictures of Brownber Hill from the east. Brownber Hill turned out to be more interesting than expected. A large cairn on the north west side of the fell provided excellent views of Knock Pike, Cross Fell, the Dun Fells and Knock Fell while the view of Dufton Pike was tremendous all along the western flank. The summit of Brownber Hill was, like Dufton Pike, unmarked by cairn and was everywhere grass. I had thought that the crags to the south of the summit would be almost unreachable but as I began to descend I noticed a thin trod which contoured round quite nicely to the middle of the crag from where it looked like it would actually be possible to scramble up with a bit of care. Being able to get out on to the rocks and enjoy the view down into Great Rundale was the icing on the cake. The descent was straight forward, steep but short, and fortunately there were paths to be found through the extensive bracken covering the southern slopes of the hill. Just as I was arriving back in Dufton the sun, as so often happens at the end of the walk, finally broke through the cloud. For once though I didn’t mind as the passing showers had actually contributed to my enjoyment of the walk.